Hayfever season is upon us! 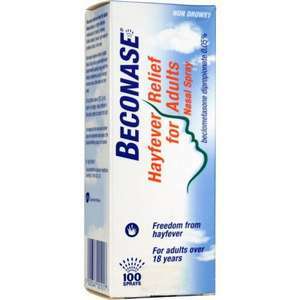 Beconase Hayfever Relief for Adults Nasal Spray is a highly effective medication for treating hayfever. Unlike tablets it works right where the problem starts, in the nose. Assuming you want more than one bottle, it's still much cheaper to buy a generic version online (even with delivery charges). Assuming you want more than one bottle, it's still much cheaper to buy a … Assuming you want more than one bottle, it's still much cheaper to buy a generic version online (even with delivery charges). can you please point me to these generic versions.I have had a search the only one I could find are out of stock. can you please point me to these generic versions.I have had a search the … can you please point me to these generic versions.I have had a search the only one I could find are out of stock. Great price, dont recall ever seeing it this cheap. Been cheaper lots of times (HUKD search :3), but this is probably the best price at the moment. For anyone who struggles with over the counter stuff, avamys is amazing (prescription only) - my doc prescribes me 2 at a time (lasts me 6 months total) as I pay for prescriptions so works out at £4 a bottle. Thought I would post as works out similar price to over the counter stuff if your doc is willing to prescribe as many as you need - my Summer life has been completely transformed by it! Thats one easy way to get your identity stolen, card details stolen, personal details sold on. How long do you get hayfever for? Why do you need to buy such bulk amounts of it? if you insist on the beconase logo + packaging then it is cheapest - unless you get your GP issue you a private prescription for the beconase 200 dose pack (not on the shelf). the chemist usually charge around £3 to £6 for this. if you insist on the beconase logo + packaging then it is cheapest - … if you insist on the beconase logo + packaging then it is cheapest - unless you get your GP issue you a private prescription for the beconase 200 dose pack (not on the shelf). the chemist usually charge around £3 to £6 for this. Its not about any other brands. Not about the cheapest hayfever medicine. Not about getting a prescription. It's ONLY about the deal descibed in the title. Eh??? Assuming you use a legitimate company, such as the one I linked to, what's the problem?